It's 4:30 a.m. and none of the staff are awake when we unlock the front door of the hotel and load our gear into the rental van. I’m a bit worried that if someone wakes, they’ll think we’re skipping out without paying. But no one stirs, which is just as well. 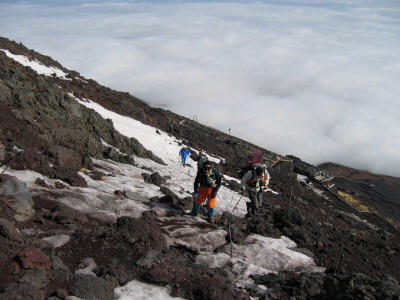 It would be difficult for us to explain in our broken Japanese that we're just on our way to climb and then snowboard down Mount Fuji and that we'll return later. My friend Oli (a fellow rider who also moonlights as a lawyer) and I comprise the summit team, while our wives hold down base camp in a local town's cafe. Oli and I do a lot of snowboarding together. We work for the same law firm in Tokyo, and together we've explored many of the ski resorts around Japan. This past season, equipped with snowshoes and avalanche gear, we started to explore the hills and backcountry readily accessible from the local resorts. As they say, a little knowledge is a dangerous thing, and after a few days' worth of backcountry experience, Oli and I are both confident that we can take on Ol' Man Fuji. Mount Fuji is visible from Tokyo, and on most mornings, particularly during the winter, I can see it from my office window towering over the surrounding hills. It's like the big kid in every class photo - hulking in the background and looming above its contemporaries. 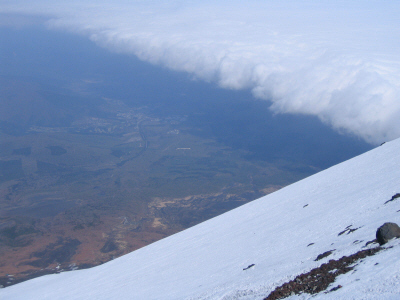 Mount Fuji is much more than just a mountain in Japan. It dominates Japanese culture as much as it dominates the landscape; the quintessential image of Japan (for foreigners and Japanese alike) is a picture of Mount Fuji covered in snow with a bullet train and/or cherry blossoms in the foreground. 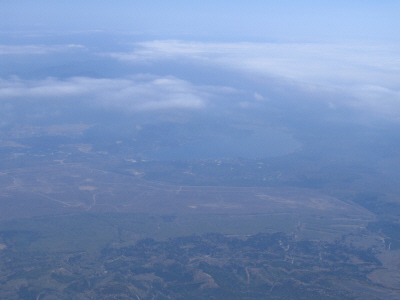 In addition to being an active volcano and a national icon, Mount Fuji is also a massively popular tourist destination. 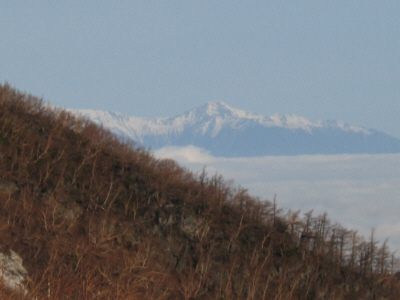 During the height of summer, hordes of Japanese in enormous conga lines inch their way to the top of the mountain with hopes of watching the sun rise. This is to be expected, I guess, in the land of the rising sun: climbing the nation's highest mountain to watch the sun rise has a certain cultural symmetry to it. 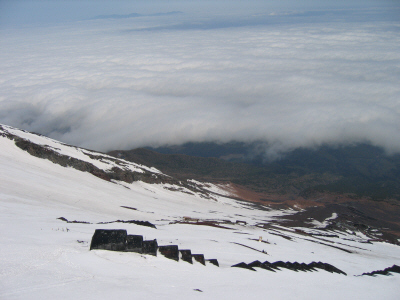 For snowboarders living and working in Japan's endless grey urban sprawl, Mount Fuji's height and geometric perfection offers something more. On a clear winter's day, a snow covered Mount Fuji glitters on the horizon like a mirage of some unattainable snowboarding nirvana. 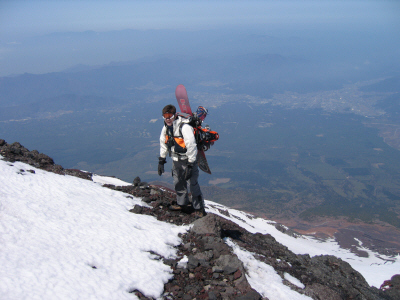 Every snowboarder I know feels the same way - to ride down Mount Fuji, to carve for kilometer after kilometer through the trackless power that cloaks the mountain's flanks, will be akin to a surfer riding the perfect wave. We are not surprised when we arrive at the start point of our climb at 5:30 a.m. to find the place full of hikers and sightseers. 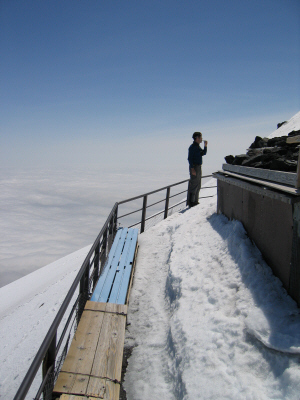 There are places in Japan where one can escape the crowds, but Mount Fuji isn't one of them. We drive the van through the car park to the start of the hiking trail and rather self-consciously unload our gear. Faced with graceless foreigners breaking the rules, Japanese officialdom typically responds in one of two ways: enforce the rules with a breathtaking bureaucratic zeal or, more rarely, ignore the foreigners and thereby avoid an embarrassing confrontation. If we are caught by the park rangers the consequences would be quite trivial (at worst a long lecture and instructions on how to leave the mountain), but even this would be enough to ruin our plans. In short, if we don't do it today, we probably never will. 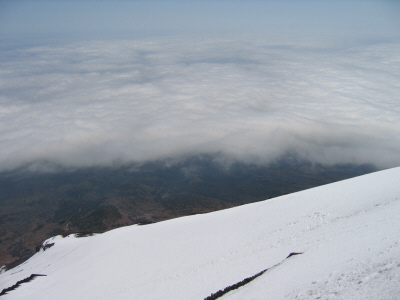 At 3,770 meters, Mount Fuji is high enough to induce altitude sickness, and in winter when storm fronts blow in from Siberia, it's a piece of land that deserves serious respect. 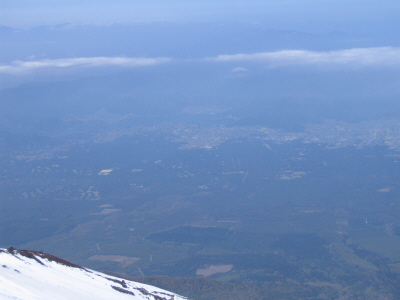 The window of opportunity to climb and ride Mount Fuji is surprisingly narrow. 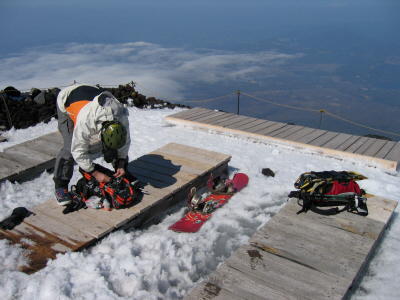 Even in early May, getting caught on the mountain in bad weather could be serious, but any later in the year and most of the snow will be gone. 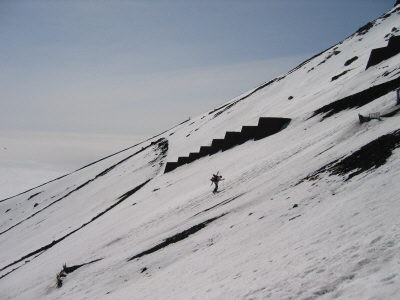 It is impossible to disguise the fact that we are carrying snowboards or what we plan to do, but the only attention we receive is the occasional sidelong glance and indulgent smiles from other hikers. As we walk along the trail, someone asks if he can take our photo. Despite our genuine concern over being caught by the park authorities, we dutifully stand still for several moments in front of a Japanese guy and his giggling friends while he clicks away. In Japan, photography is a serious business. As the gradient of the trail increases, the number of families and sightseers diminishes, so that 20 minutes after leaving the car park we are pleased to find ourselves in the company of only a handful of other climbers. Some are better prepared than others; they range from young guys in their snowboarding gear and little else (after exactly how many beers last night did climbing Mount Fuji seem like a good idea, I wonder) to weathered old blokes who appear to be equipped for an assault on Everest and have definitely done this before. With snowshoes, avalanche gear and enough food and clothing to sit out the worst of blizzards, we fall somewhere in between. 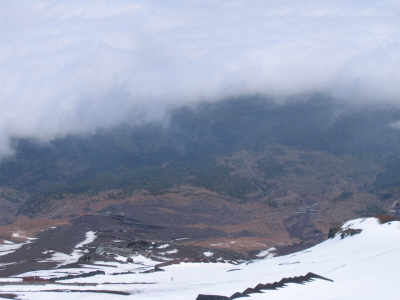 There is a strong, cold wind blowing around the mountain, but it reaches us only occasionally. For the most part, and despite our labored efforts, we are able to enjoy a warm day with a limitless view and a brilliantly blue sky. 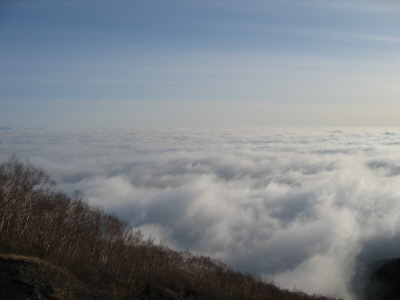 The top of the cloud level has stayed at around 2,200 meters, obscuring the view of the countryside at the base of the mountain but offering glimpses of the Japanese Alps in the distance. This year has been a good season for snow, and both Oli and I have chalked up several weeks' worth of riding. Unfortunately, our last outing was months earlier and we've lost any fitness that we may have developed during the season. 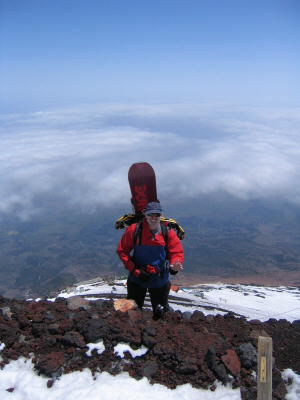 A lawyer's life, as exciting as it is, is not great preparation for mountain climbing. After several hours of climbing, we reach the snow line at around 2,700 meters; it has become painfully apparent that we are carrying way too much gear and are terribly under prepared physically for the climb. Our progress has slowed significantly, and we stop to catch our breath with increasing frequency. There is no ice, but the snow isn't deep or soft enough to let us use our snowshoes. Where we can, we walk on the rocky outcrops poking through the snow cover, and where there are no rocks, we walk in the footsteps of other climbers. 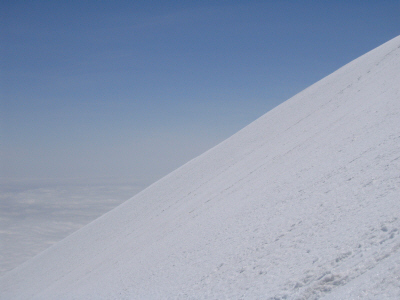 The farther we climb, the steeper the gradient and the more precarious our footing becomes. At times it feels like I'm only a toehold or two from sliding back down the mountain. 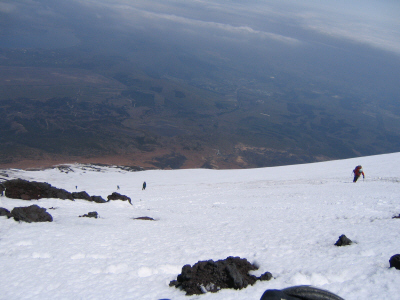 Admittedly, sliding back down is the reason we are climbing Mount Fuji in the first place, but I am desperately trying to avoid doing it sitting on my arse. The side of the mountain is cluttered with shelters and large cement blocks intended to stabilize the slope. There are also steel posts and signs and jagged lumps of volcanic rock sticking out of the snow; I am acutely aware that an uncontrolled decent now would hurt, a lot. We rest by leaning on our poles or, more often, collapsing onto the snow, gasping for air and watching the other climbers struggle up the path. We're not the only ones doing it tough, and most of the younger guys have turned back. It's just us, the old guys (now a long way in front), and a team of genuine mountaineers training for an assault on K2 by repetitively climbing and descending the top half of the mountain. Our minds balk at the thought of climbing another five kilometers of vertical, and judging by the enormous packs the K2 team members are carrying, I suspect they probably share the sentiment. After nearly seven hours of climbing, we eventually reach the peak. Maybe it is a combination of the altitude and our lack of preparation, but the view leaves us breathless. 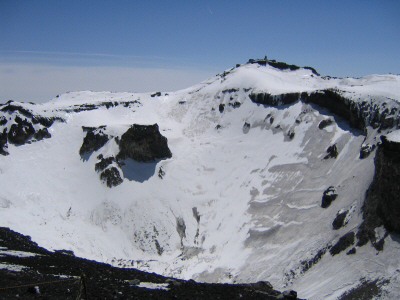 Standing on the rim of the crater, we’re able to see the slope of the mountain in an unbroken line down past the end of the snow to the tree line and further on to the lakes and towns that surround the base of Mount Fuji nearly 3,000 meters below. The contrast with the grey drabness of central Tokyo, where I live and work, could not be more profound. We take a quick look into the crater. It’s huge. It would take close to an hour to walk around the rim and it is easily a couple of hundred meters deep. 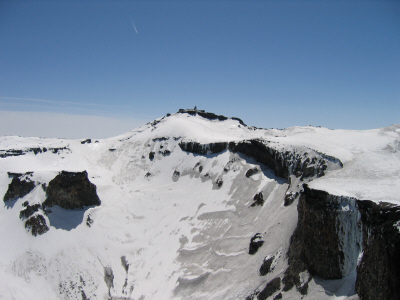 People have apparently skied into the crater, but there is no obvious way out and we can’t see how it would be anything but a one-way trip. 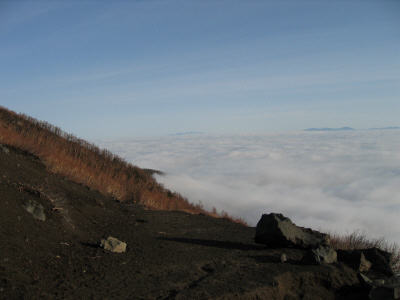 Mount Fuji erupted 300 years ago and still occasionally vents steam. We both imagine that the snow on the crater floor covers an icy lake from which there would be no escape - a snow-coated Venus flytrap. 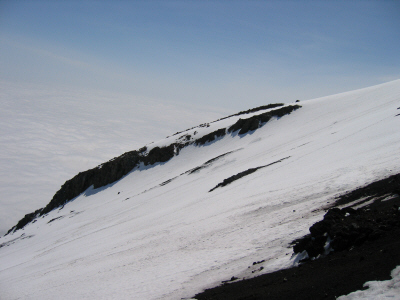 With a shudder that is not entirely due to the cold wind cutting across the crater rim, we dismiss the idea of boarding to the bottom of the crater. Reaching the peak has taken us much longer than we anticipated and, although it is only 2:30 p.m., we’re now running short of time. After eating the last of our food and preparing our gear, we spend a few minutes inspecting possible departure points for the run down. There are some very promising routes, but the lack of time means that we have to abandon the more impressive lines in favor of the most direct route to the car park. 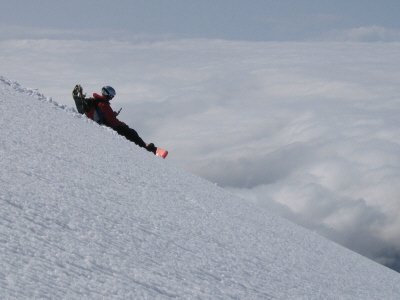 We start down wanting to let the boards run and make full use of the mountain, but our tired legs limit what we can do. The condition of the snow also works against us. From a distance it looked clean and pristine, but it is actually quite old and there are large sections with dark shadows hinting at the rocks just below the surface. When we do hit decent patches of snow, the lack of reference points makes it difficult to judge our speed and so we find ourselves traveling more slowly than we'd like. Despite all this and the weariness we're feeling, we’re laughing and yelling like a pair of school kids. This is easily the best ride of the season. It takes us close to an hour to make our way down the mountain. We're exhausted and filthy by the time we reach the trail. We burst out of the bushes beside the path in front of gawking tourists and head back toward the car park. I'm pleasantly surprised by the enthusiastic welcome that we receive from Donna and Kirsten. After a tedious day of waiting for our return, I expected a little less of the "welcome, conquering hero" and more of the "what took you so long?" attitude. My snowboard is covered in mud and dirt, but this doesn't stop Kirsten from offering to carry it for me. I'm not sure whether her intention is to ease my burden or to prevent a repeat effort by confiscating it. I decide to keep hold of my board and start planning for next year. Oli near the end of the climb. We were almost on all fours by this stage as the wind, altitude and general exhaustion nearly combined to send us back down the mountain. From about half way up the mountain, while we were following the path or climbing up the rocky outcrops we had to our left a seemingly endless expanse of untracked snow. Often, a quick glance to the left was all that was needed to revive our flagging spirits. The wind was coming from the other side of the mountain and pushing the cloud cover with it. The result was that Mount Fuji was parting the cloud and keeping the air behind it clear – much like a ship’s bow pushing through waves. Me, using our emergency communications equipment to let our wives know that we’re on our way down. Naturally enough, I couldn’t get a signal.